Equipment bought and paid for by unfulfilled Kickstarters? Check! Asking the public to crowd fund yet another film related dream? Checkity Check! 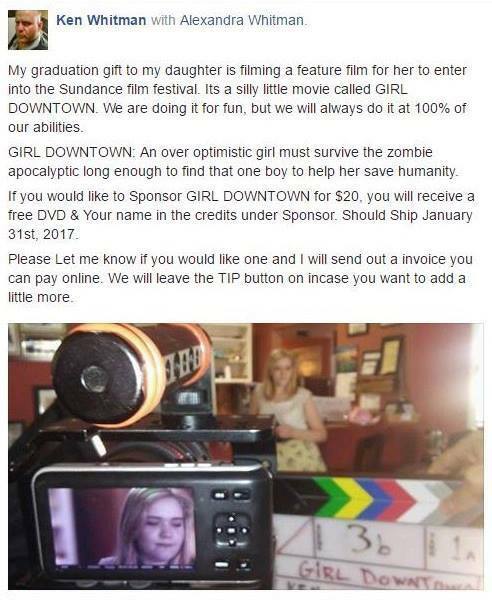 Asking $20 for sponsorship and then claiming the DVD is free? Checkity Check Check WTF?!? Ah Kenny, a gift to your daughter, paid for by forgotten Kickstarter backers and fresh meat to be bilked. At least you are true to your nature. How does he manage to hide his practices from others.Can't he be labeled with a BBB warning? BBB has zero power in this day and age. Ridiculous doesn't even begin to describe this. He just can't help coming back to the same well to drink can he...? Poor Ken. How do you self promote and hide at the same time? He doesn't have a guilty conscious. Is that anything like a conscience? I guess I will never get the complete instructions to the Knight's Quest Family Card game but better to be out $20 than some poor others whose contributions were greater on other Whitman crowdfunding campaigns. What platform is he crowdfunding this on? In light of his prior failed KS's and how he abandoned them I think it'd be a simple matter to report the campaign to their customer service and have them shut him down. It's on GoFundMe... https://www.gofundme.com/girldowntown And Kenny-boy's name is nowhere to be seen on the page. And the first thing he does at the top of his page is to threaten anyone saying anything negative about him (or anyone else connected with this) with LIBEL!! He even quotes the Georgia state statute. Damn. He's blocked me on all four FB accounts. As if Sundance accepts this kind of amateur stuff. And the GoFundMe page has been deleted. If you check the cached page, the only donation they got was from Jolly just to make a point. Kenny doesn't seem to understand that his name is POISON to anything he's involved with at this point.